What do several minutes mean in terms of building your online business? From the marketing standpoint, it’s hardly anything. But there is a couple of web tools persuading to the contrary. And one of them is a countdown timer which requires a couple of steps to be fully set up. Moreover, it’s a beautiful marketing technique. As for why, that might take a little longer to explain. In some cases the countdown timer makes a sense of urgency. Just like in real “hurry up! the last days of discount” shop advertising, the countdown timer on the website can have the same effect on the site visitors and become a great instrument to increase your sales and conversions. You can make your site memorable when it’s not launched yet. The replacement of default under construction banner with a dynamic and precisely informative (even the seconds can be counted) countdown timer will make your site catchy and even more trusted as it will mean that you are professional enough to determine the exact launch date. However, if the situation with launch terms changes, you are free to set another expiration date of the countdown any time. Adding a countdown timer to announce any product release, time limited offers and events, flash sale promotions and to define discounts can not only result in substantial increase in profits, but also makes a need for the site visitors to translate dates across time zones unnecessary. So, it fulfills several functions at a time. 1. As one of the options of the Visual Page Builder. The installation of Content Editor is required. 2. 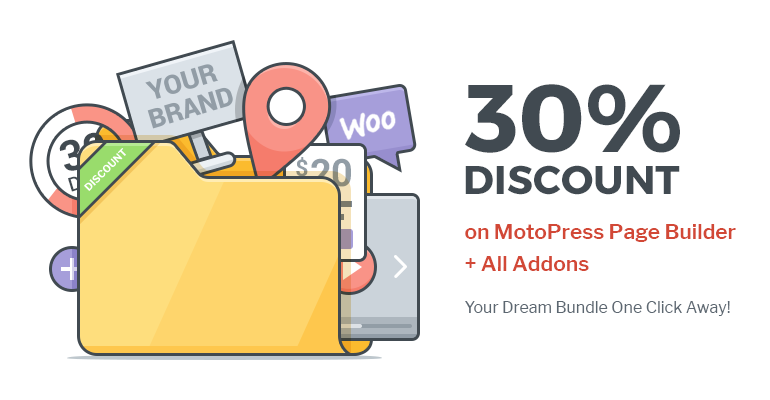 And the Pro version with advanced options which also requires MotoPress WordPress Page Builder installation. 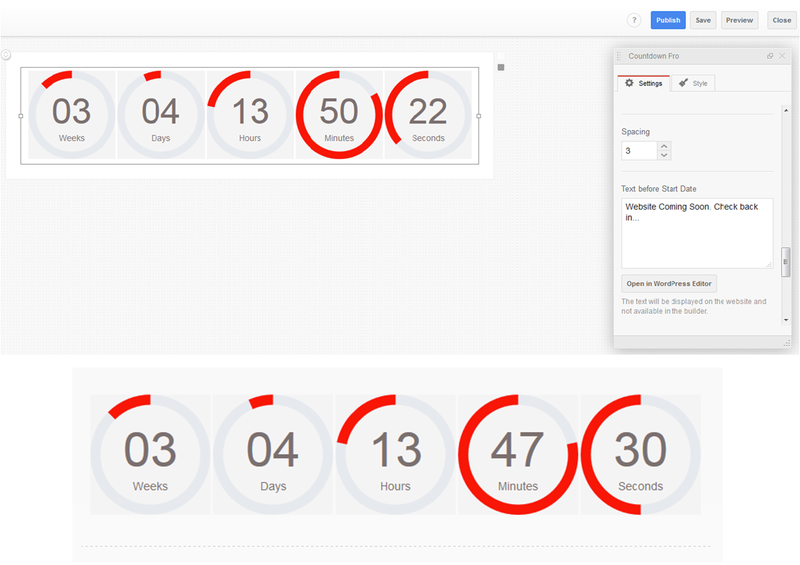 The Countdown Timer Pro Addon takes a few minutes to be added and customized. Set expiration date, main colors and sizes of the timer and you are ready to go. customizing abilities for track color, track background color and width of circle-styled timer. You can also adjust the size of the blocks to put the small countdown timer in the post or to pay more attention to it by enlarging the blocks. While a lot of website owners may become puzzled over intricate marketing schemes, they don’t pay attention to small and easy tweaks that can do a significant part of a job. And very often for a song. Thinking that your website is not about sales and promotions? 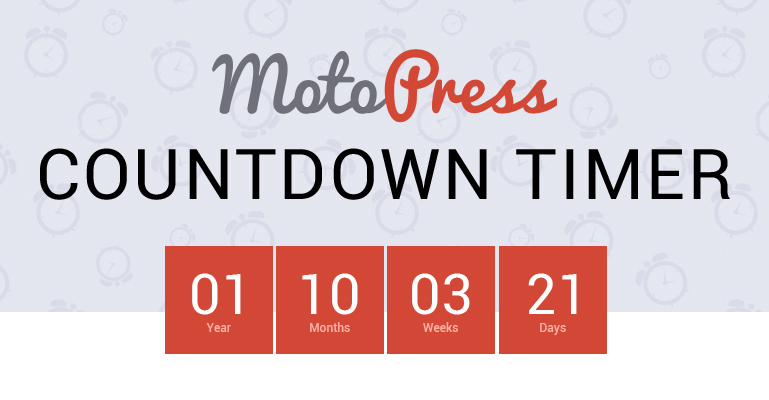 In fact, the Countdown Timer by MotoPress can be adjusted for absolutely versatile purposes. For example, if you’re a photographer, such a timer can count the days till your very important shooting or presenting new portfolio, so the site visitors are engaged in monitoring the process. If you run any informative business website, the countdown can be installed to set any kind of deadlines or competitions, etc. Just free your imagination and you’ll come up with a lot of brilliant ideas.